Snow chains in Zakopane, or tire chains in Zakopane, are devices fitted to the tires of vehicles to provide maximum traction when driving through snow and ice. 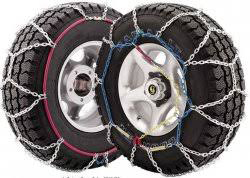 Snow chains attach to the drive wheels of a vehicle or special systems deploy chains which swing under the tires automatically. Although named after steel chain, snow chains may be made of other materials and in a variety of patterns and strengths. Chains are usually sold in pairs and often must be purchased to match a particular tire size (tire diameter and tread width), although some designs can be adjusted to fit various sizes of tire. Driving with chains reduces fuel efficiency, and can reduce the allowable speed of the automobile to approximately 50 km/h (30 mph), but increase traction and braking on snowy or icy surfaces. Some regions require chains to be used under some weather conditions, but other areas prohibit the use of chains, as they can deteriorate road surfaces. If you're in Zakopane and are looking for tires services in Zakopane or snow chains in Zakopane. Call Us: 604 637 715. We help You.